This charming cottage design offers easy living with modern features. A single dining room and vaulted great room are completely open to the kitchen, where counter seating is ideal for quick family meals. 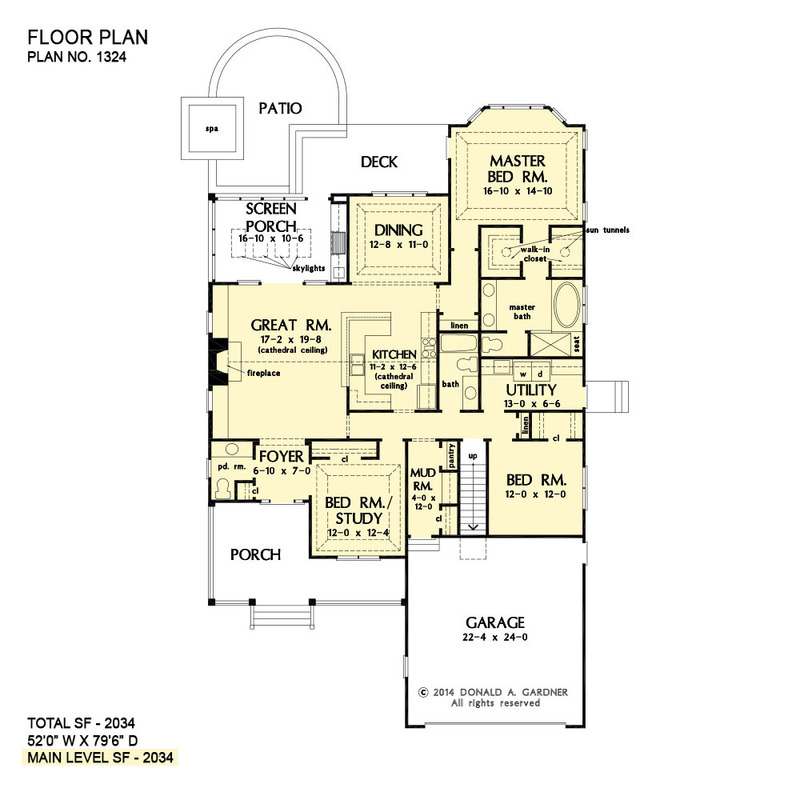 Separate mud and utility rooms provide storage and workspace hidden from view of the living areas, while a spacious master suite and screen porch with skylights and summer kitchen add luxury. 1st Floor: 2034 Sq. Ft. 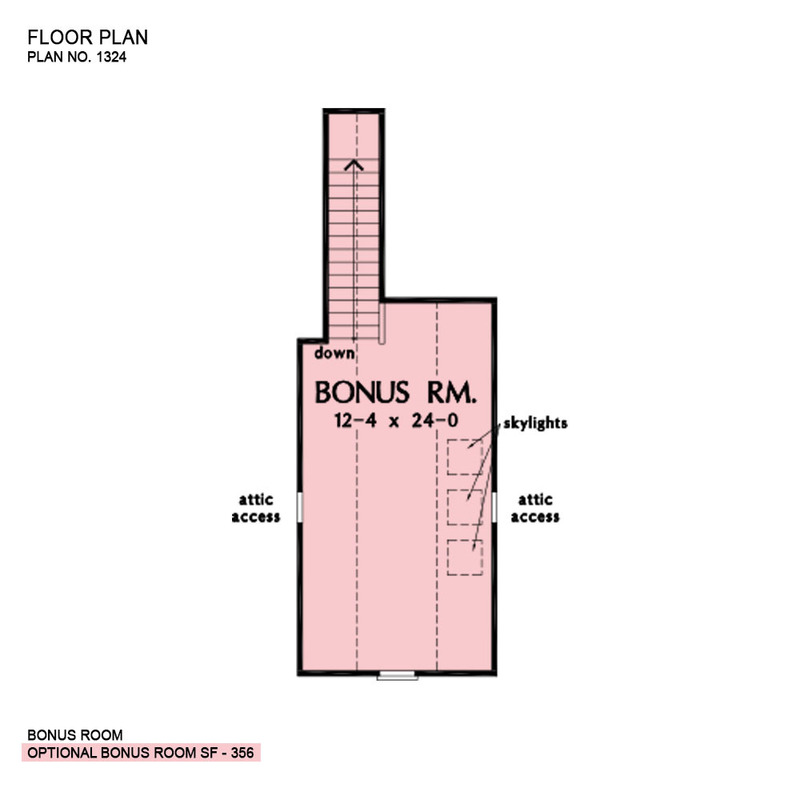 Bonus Room: 356 Sq. Ft.
Porch - Front: 243 Sq. 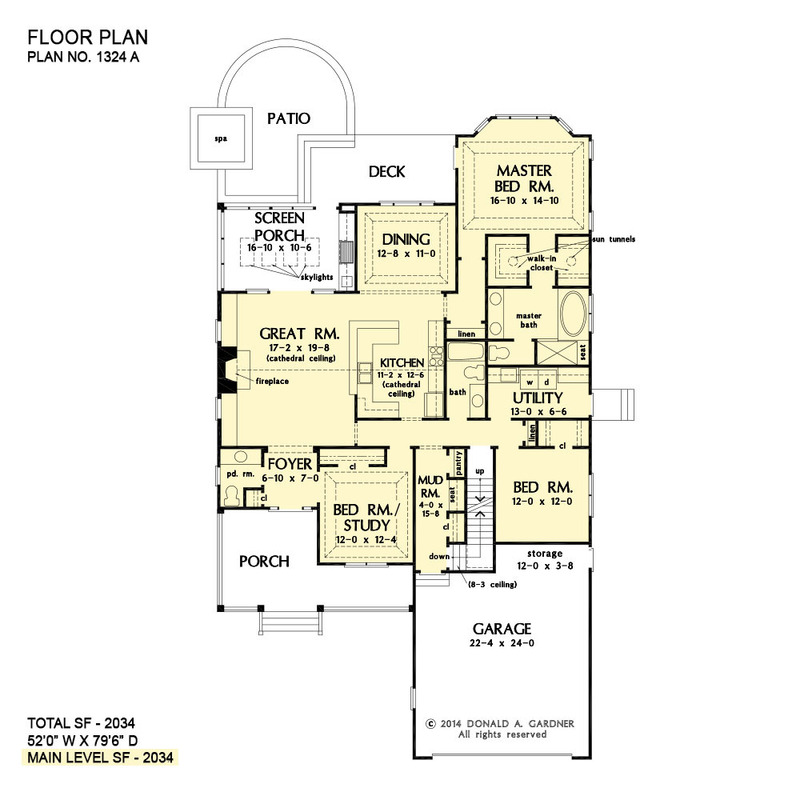 Ft.
House Dimensions: 52' 0" x 79' 6"
Great Room: 17' 2" x 19' 8"
Master Bedroom: 16' 10" x 14' 10"
Foyer (Flat): 6' 10" x 7' 0" x 9' 0"
Dining Room (Tray): 12' 8" x 11' 0" x 10' 0"
Great Room (Cathedral): 17' 2" x 19' 8" x 17' 9"
Kitchen (Cathedral): 11' 2" x 12' 6" x 17' 9"
Utility Room (Flat): 13' 0" x 6' 6" x 9' 0"
Bonus Room (Clipped): 12' 4" x 24' 0" x 9' 0"
Garage (Flat): 22' 4" x 24' 0" x 0' 0"
Master Bedroom (Tray): 16' 10" x 14' 10" x 10' 6"
Bedroom / Study (Tray): 12' 0" x 12' 4" x 10' 6"
Porch - Front (Flat): 12' 10" x 13' 2" x 9' 6"
Porch - Right (None): 3' 10" x 4' 0" x 0' 0"
Deck / Patio (None): 18' 8" x 8' 10" x 0' 0"
Porch - Screen (Flat): 16' 10" x 10' 6" x 9' 0"
Patio - Rear (None): 17' 8" x 21' 2" x 0' 0"
Mud Room (Flat): 4' 0" x 12' 0" x 9' 0"